Snapchat received a $10 billion valuation this week, joining an ever-increasing number of young IPOs and startup companies that are meeting consumers’ evolving needs to create extraordinary value for investors. How can Snapchat, Uber and Airbnb be worth so much? An answer to that question may come from an unexpected place. American psychologist Abraham Maslow is best known for his seminal research on the hierarchy of innate human needs, but his work also has a surprising application for businesses models and shareholder value, according to Barry Libert, Jerry Wind and Megan Beck Fenley, who wrote this opinion piece. 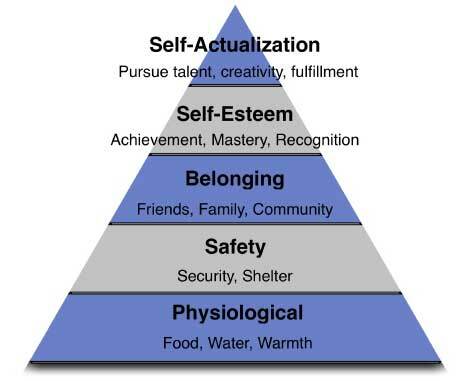 In 1943, Abraham Maslow developed his formative work on the hierarchy and progression of human needs, “a theory of psychological health predicated on fulfilling innate human needs in priority, culminating in self-actualization.” Maslow insightfully noted that the human hierarchy of needs spans from the tangible, such as food and water, to the intangible, such as self-esteem and creativity. Maslow would probably be surprised today to discover that a similar progression can also be observed in the business world. Many firms, enabled by new, digital technologies, are making the shift from providing goods and services — physical things — to providing information and connectivity — intangible things. This shift is already creating ripples of change in finance and financial markets. Companies that serve these higher, more intangible needs of customers are being rewarded by the financial market with higher valuations than those that serve the lower, more tangible needs of customers that include structure and sustenance. Snapchat, Airbnb and Uber are just the tip of the iceberg of $10 billion startups and $100 billion public companies. Put simply, the ways businesses meet the needs of their stakeholders, and the types of needs served, have changed over time along with the development and adoption of new technologies. Together, these needs and enabling technologies create different business models, each with their own scalability, capital and operating efficiencies and, therefore, valuation. The bottom two levels of Maslow’s hierarchy relate quite closely to the agrarian and industrial revolutions in which large organizations were constructed to fulfill the physiological and safety needs of people. These industries include farming, water, utilities, irrigation, real estate and energy (physiological needs), as well as fire, police and the military (safety needs). Belonging: Many companies now exist to facilitate communities. Facebook connects people with their friends, LinkedIn with their colleagues and Match.com with potential mates. There are also many highly specific communities for people dealing with unusual circumstances, such as rare diseases (e.g., RareConnect.org) or unusual hobbies (e.g., ArcheryTalk.com). Many of these communities had not been able to gather and communicate previously. Self-esteem: There are also many new ways for people to demonstrate, and be recognized, for their achievements. From the slightly frivolous, “How many likes did my new profile picture get?” to the utilitarian, “How many stars did my most recent Airbnb guest give my apartment?” we are now able to measure our quality and impact in myriad ways. Self-actualization: Finally, new organizations are enabling people to express themselves creatively and/or make a living in innovative ways. Instagram allows creative expression through photographs. Etsy gives artisans a forum to share and sell their handiwork. Uber and Airbnb allow people to take control of their careers and to make a living using their resources in a new way. It is not surprising that businesses have grown in scope to serve these higher order needs, particularly in a world in which the middle class is growing and they have fewer physiological and safety concerns. What is surprising, however, is how dramatically companies and their investors have shifted their capital from tangible, asset-based businesses (aligned with the bottom two needs) to intangible, asset-light organizations (aligned with the top three needs). 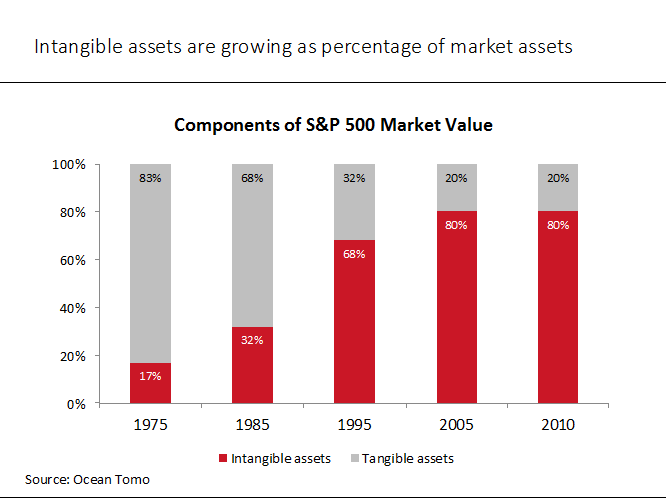 According to research by Ocean Tomo, in 1975, tangible assets made up 83% of the market value of the S&P 500 companies. By 2010, the numbers had flipped completely, and intangible assets constituted 80% of market/corporate value. Put simply, the finance function, and generally accepted accounting principles (GAAP), must adapt in order to help organizations measure and manage these new sources value (communities of common interest, self-esteem, self mastery and self-actualization). Accounting practices have not kept pace with the changing asset base of business as well as many key intangible assets. In fact, many higher-order needs of individuals are either mis-measured (lumped into the Goodwill grab bag), or ignored altogether. Human capital, such as employees, is classified as an expense. So are employee training, education and health care. Worse, customers and their relationships are not measured at all. This situation does not serve business leaders well, particularly leaders of large, established companies that are trying to find the right way to develop and use more scalable and capital-efficient intangible resources together with today’s technologies to drive performance and shareholder value. This mismatch provides a large opportunity for accounting firms to help leaders understand these different sources of value and thereby change the landscape for how business is done and governments are run globally. 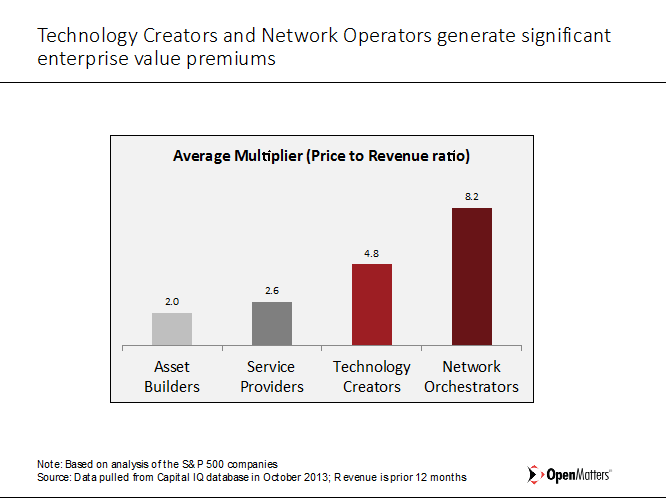 Helping leaders understand and utilize intangible assets becomes even more urgent when you realize that the financial markets have already adjusted their thinking and capital allocations in favor of these newer, intangibles-based business models that use today’s technologies to scale at zero, or near zero, marginal cost. Our research, conducted by OpenMatters in partnership with Deloitte, looked at 40 years of data from the S&P 500 companies and found that investors are rewarding organizations that satisfy these higher levels of customer needs, such as community, esteem and self-fulfillment, with valuations that are far greater than the organizations that satisfy the lower-order physiological and safety needs. Asset Builders that make, market, distribute and sell physical products. Examples include manufacturers (all industries), distributors and retailers. Service Providers that hire people who provide services for which customers are charged. Examples include consulting firms, health care providers and financial institutions. Technology Creators that develop and sell intellectual property, such as software and biotech. Examples include software and pharmaceutical companies. Network Orchestrators that create and manage networks of consumers, businesses or investors to help the participants market and sell their wares on a peer-to-peer basis. Examples include financial trading markets, on-line social networks and credit card processing companies. Simply, this: There is a great shift in value that is occurring globally as organizations climb Maslow’s hierarchy to serve our less tangible needs. In fact, we are just beginning to witness the power of firms that use today’s technologies to fulfill the belonging, self-esteem and self-actualization needs of individuals Twitter . From well-known network players like Facebook, Airbnb and Uber, to smaller startups like Behance.com and Spoonflower, to older established companies like GE and AT&T, the market is moving towards intangibles. Orientation: Understand the needs of your networks that you have not fulfilled, including community, self-mastery and self-actualization. Example: Trip Advisor created a customer network that shares hotel and travel reviews, allowing them to be viewed as trusted experts. Assessment: Inventory all your relationships — their number, sentiment, capabilities, level of engagement and resources. Example: AT&T’s The Innovation Pipeline (TIP) is a crowdsourcing program that enables employees to generate, and vote on, innovative ideas for the company. Action: Determine which technologies, platforms or ecosystems are essential to connect stakeholders to each other so that they can fulfill their own needs and yours. Example: LinkedIn uses social software to connect the world’s professionals to enable them to be more productive and successful. Measurement: Analyze the results of your actions and those of your network members to see the value that is being created and shared. Example: Amazon.com carefully measures and tracks the inventory and transactions of its network of third party sellers to that it can support and ensure quality from this revenue stream. All organizations, whether for profit or not, are in the business of satisfying the wants and needs of their customers. Investors, on the other hand, are in the business of rewarding, with their pocketbooks, the companies that best serve the essential needs of their customers with the most efficient business models. Given that we are now beginning to connect the dots between what customers value (their hierarchy of needs) and what investors reward (zero to low marginal cost businesses that scale through customer co-creation), it’s time for executives (particularly the CEO and CFO), leadership teams and boards to measure and invest in what matters — not just the tangible assets at the bottom of Maslow’s hierarchy (material and tangible), but also the immaterial and intangibles at the top — so that their companies develop the tools and skills that deliver what matters to their customers. The result: more value for their investors. The bottom line: In following Maslow’s approach to value, firms will participate in people’s entire hierarchy of needs and generate extraordinary value in the process. What more can an investor and customer ask from a company? Barry Libert is CEO of OpenMatters and a board member/senior fellow of the SEI Center at Wharton; Jerry Wind is director of the SEI Center and a marketing professor at Wharton; and Megan Beck Fenley is a digital consultant and researcher at the SEI Center/OpenMatters. Maslow also said, “The good society is one in which virtue pays” so we’ll have to see where our “higher selves” lead us. After spending several months in a factory and publishing his journal of observations as “Eupsychian Management” (1965) which later got repackaged and published as “Maslow on Management” (1998), it is probably untrue that “Maslow would probably be surprised today to discover that a similar progression can also be observed in the business world” as the authors wrote. Maslow learned a lot from Alfred Adler, and Adler learned a lot from his early days studying the health needs of laborers in small garment-making and tailoring shops in Vienna. In that sense, the workplace implication of Maslow’s psychology was one of his primary concerns, and certainly not an afterthought. Hats off to Barry Libert, Jerry Wind & Megan Beck Fenley! Your study is a very valuable link in the chain of evidence that a re-definition of what actually constitutes “capital value” going forward in the 21st century is long overdue. GAAP accounting principles are based upon financial standards developed in the 19th century that in many categories were conceptualized by theoretical economists in, or prior to, the 18th century. For almost an entire generation now, venture capitalists and financial market strategists have been operating to execute winning market plays far beyond those old financial goalposts, and it is high time that today’s economists deepen & expand their economic definitions, theories & models to catch up to adequately encompass the new valuations of capital value that dominate & tower over today’s financial landscape. Even Mr Piketty’s masterwork, ‘Capital in the 21st Century, which some might be tempted to point to as a step in the right direction, primarily limits itself to documenting that inheritance, one of the most ancient forms in human history of transferral of wealth, is taking place at an ever increasing rate of concentration, while it virtually ignoring the far more significant development that the manner & means of generating capital wealth, by any definition, is demographically mushrooming amidst the world’s population at an unprecedented rate never before seen in all of human history. However dynasties, aristocracies, oligarchies & plutocracies and their continuance by inheritance for some period of time are old news in economic history, as the names of Elizabeth, Medici, Rothschild or Rockefeller would attest. In stark contrast, the manner & means of generating the sheer enormity of capital value garnered without inheritance or force of arms by the likes of Gates, Jobs, Brin & Zuckerberg by devising platforms for monetizing intellectual property from ‘Popular Mechanics’ geek interests to the status of fundamental modern day must-have items are completely beyond anything Adam Smith or Karl Marx could ever even imagine, let alone theorize an economic model to account for it. No wonder so-called “modern” accounting principles largely based upon economic theories formulated during the times of Smith or Marx, respectively, are at a loss to truly assess capital valuations for new-tech IP enterprises in this day and age. It’s time for economists to get down to the hard work of defining anew the fundamental operational postulates of the field of economics going forward in the 21st century, or face the certainty of ever-increasing irrelevance. Except for some convoluted way of linking Maslow hierarchy to this opinion piece, you have brought some very important observations esp. wrt how the composition of market value has changed over time. It will also be interesting to research on which is likely to sustain the hard asset heavy or the soft asset heavy system, in the coming times. I will also be interested in understanding how changing the Accounting standards impact the way businesses are being run in all types of organizations.